Indian cuisine is favored by vegetarians due to the many varied and tasty options, from a chickpea curry to garlic-tinged lentils to paneer cheese in a rich sauce. This selection of most-searched-for and most loved Indian vegetarian recipes are not just made up of favorites among Indians; people all over the world enjoy these recipes. And you will too. 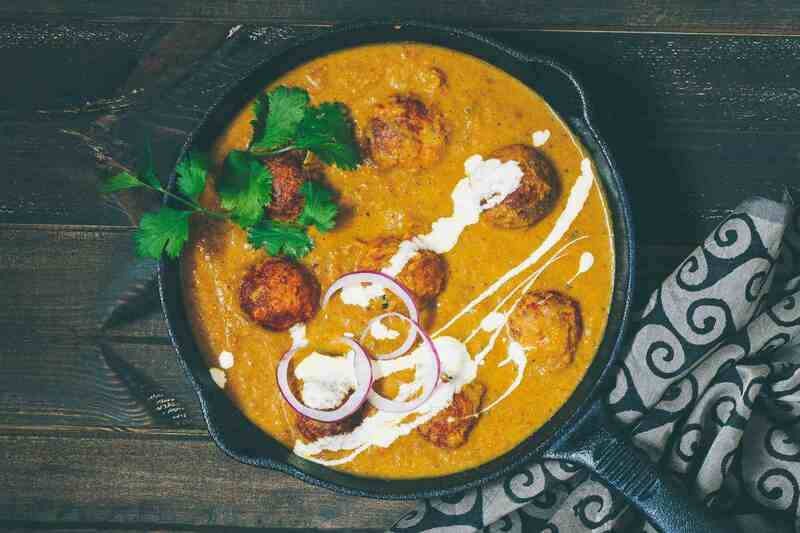 A dish for special occasions, Malai kofta is the delicious vegetarian alternative to meatballs (in Indian cuisine, koftas are meatballs). Although this recipe may take a bit of time to make, the flavorful and creamy results are worth it—and will please any vegetarian looking for a hearty dish. Potatoes, a mixture of vegetables, paneer cheese, heavy cream, and spices are combined well and formed into balls, and then stuffed with chopped nuts and raisins. The koftas are then deep-fried and served in a well-seasoned gravy. Palak Paneer a favorite North Indian recipe, this mildly flavored dish is super healthy too. Cubes of paneer cheese (similar to cottage cheese but look more like tofu) are pan-fried and then simmered in a spinach-based gravy. Flavored with fenugreek leaves, onion, garlic, tomato, and several Indian spices, palak paneer is a nutritious meal that will also satisfy the taste buds. Wholesome, tasty, and very, very popular, rajma is great even when simply served over plain rice. Perfect for a busy weeknight, this recipe cooks in less than 30 minutes and uses just one pan. Onions, garlic, and spices are toasted and fried until aromatic; the beans and water are added and cooked until soft. This recipe calls for a pinch of asafetida, which is from a fennel-like plant and has a very strong onion-garlic flavor. Mutter means peas, and paneer is a solid cottage cheese, so this mutter paneer dish combines the two in a rich tomato-based gravy with a touch of cream. The traditional Indian spices such as coriander, cumin, turmeric, and garam masala work alongside garlic and ginger pastes and green chilis to create a vegetarian dish that doesn't skimp on flavor. Serve mutter paneer with parathas, naans, and even jeera rice. Kaali daal is also known as ma ki daal (meaning "mom's lentils") because it is so wholesome, comforting, and delicious. You do need to plan ahead as the lentils have to soak overnight before being cooked along with onion, green chili, and asafetida until tender. The lentils are then added to a tomato gravy seasoned with Indian spices and a touch of cream, and then cumin seeds toasted in ghee are stirred in before serving. This is a pretty basic chole dish but brings a lot of flavor to the dinner table. Chickpeas are simmered for just 10 minutes in a homemade gravy brimming with quintessential spices. Smashing some of the chickpeas creates a nice, thick consistency, perfect for scooping up with pooris/bhatooras (fried Indian bread). Looking a lot like a pancake, aaloo paratha is actually a flatbread stuffed with a richly seasoned mashed potato. The coriander, cumin, turmeric, chili powder, and ginger bring a nice savory flavor that is complemented by a dollop of chilled yogurt and your favorite pickle or chutney on the side. Parathas also taste delicious with a drizzle of fresh, thick cream or a bit of unsalted, homemade butter. Of course, you can make a kabab from pieces of fresh vegetables, but this vegetarian kabab is so much more satisfying. In Indian cuisine, kababs are a wide variety of grilled meat, some that are mixtures of ground meat and seasonings. Hara Bhara kabab utilizes vegetables to achieve the same texture and gets its name and green color from the healthy spinach, peas, and fresh coriander leaves. When combined with potatoes, ginger, and chaat masala (a spice powder mix), the result is a delicious and filling veggie patty that's perfect as a snack or part of a meal. This soup is not only ideal for vegetarians but is so healthy that everyone will want to eat some. Two kinds of lentils are used—moong daal and Toor/tuvar or arhar daal—along with spinach and plenty of flavor. Cumin seeds are fried in ghee along with red chili, garlic, and asafetida and then added to the mixture before it is pureed. The daal-palak ka shorba soup is garnished with a squeeze of lime and a small bit of cream.